For decades we had only two solid biographies of Dr. Joseph Warren, both well researched for their times but showing their age: Richard Frothingham’s Life and Times of Joseph Warren (1865) and John Cary’s Joseph Warren: Physician, Politician, Patriot (1964). Then in the last decade two new biographies have come out. Both are products of years of parallel research that uncovered new evidence and proposed new understandings about Warren. The first was Samuel Forman’s Dr. Joseph Warren: The Boston Tea Party, Bunker Hill, and the Birth of American Liberty from 2011. 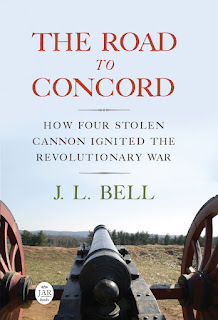 I met Sam after that book appeared, and we’ve worked together on topics like a proper site for a Dr. Warren monument in downtown Boston, how the late doctor’s mattresses ended up at Gen. George Washington’s headquarters, and the real story of Deborah Champion. This year brought Christian Di Spigna’s Founding Martyr: The Life and Death of Dr. Joseph Warren, the American Revolution’s Lost Hero, a product of decades of research. I met Christian in Williamsburg a couple of years ago, became friends, and gave him feedback on his manuscript before publication. Christian is speaking at the Massachusetts Historical Society on Wednesday, 7 November. As of now that event is sold out. He’ll be at the Museums on the Green in Falmouth on Thursday, 8 November, and the David Library of the American Revolution in Pennsylvania on Thursday, 6 December. Warren’s life lends itself to an exciting biography. One of the challenges of the form is that people are much better documented after they become famous, leaving relatively little contemporaneous evidence about the actions that made them famous and a lot of evidence about later, uneventful years. But the shape of Warren’s life is like the graph of rising action for a novel: it slants up with the Revolution in Boston, accelerates in 1774, and reaches a dramatic climax at the Battle of Bunker Hill. All biographers of Dr. Warren seem to be inspired by his heroism and quick to give him the lion’s share of credit for political projects he contributed to. I’m skeptical about some such judgments, such as that Warren wrote the Mucius Scævola essays, directed the Boston Tea Party, or was posed to become a national political figure (though even contemporaries like Peter Oliver made that claim). Warren was still a young man in a society that valued seniority and deference to group actions. Of course, we have no way of knowing what the doctor might have accomplished in his forties and beyond. He shouldered more and more responsibilities in late 1774 and early 1775. In those months Boston’s older political leaders became busy with continental affairs (Samuel Adams, Thomas Cushing), left town (Dr. Thomas Young, Josiah Quincy, Jr.), died (William Molineux), or were traduced (Dr. Benjamin Church). I think the story of Warren’s political career isn’t that he was crucial to every Boston Whig effort from the mid-1760s on but that he grew into the position of being crucial in 1775. Forman and Di Spigna disagree on some questions about Warren, emphasizing different pieces of evidence or interpreting them differently. Both books are worth reading and considering, and both add to our knowledge about a man who became vitally important to Revolutionary Boston. Christian will also be speaking to the American Revolution Round Table of Richmond on January 16, 2019. If you're in the area, please join us. If only Warren hadn't gotten the crazy idea to lead from the front. He was a doctor, not a soldier! And it was totally pointless, because he simply didn't have enough troops to stop the British advance. Ah well, so it goes.